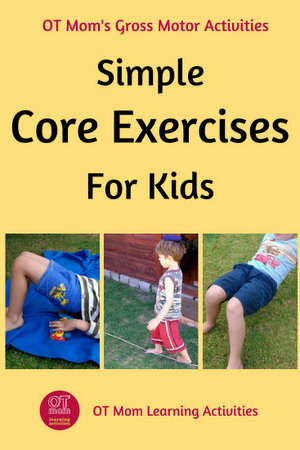 Fun Core Exercises For Kids! These core exercises for kids may help develop your child's core strength and stability. Having good core strength can help your child sit well at a desk, and helps provide a stable base for gross and fine motor tasks. 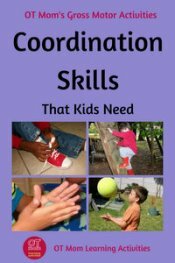 As an occupational therapist and homeschooling mom, I have used these exercises in the schools where I have worked, as well as with my own children, so they are easy to do, and designed to be done by kids who may struggle with coordination and strength. Not all children will become athletes, but all children do need core stability to be functional in daily school and home tasks. If you are at all concerned about your child's development, please get a professional opinion. The activities on this page are NOT a substitute for an occupational therapy evaluation and treatment. Leg Lifts - a good exercise for the classroom! This is an adaptation of a tummy curl and works really well if you get your child to hold for a few seconds and repeat it a few times per session. I play the recorder like a snake charmer and have the kids curl up when the music plays! - Knees bent, feet flat on the ground. - Put a beanbag between the knees to keep them together. - Hands are resting on thighs. Have your child "curl up" by raising the head, sliding the hands up to the knees and maybe even hissing at you (holding the position) until you give the signal to go back down slowly. Have kids take turns being the snake charmer! Emphasize SLOW movements, rather than fast jerky ones. Have your child walk along a rope line (or a drawn line) while balancing the beanbag on his/her head. Make it fun by saying there may be alligators in the water so don't step off the rope! 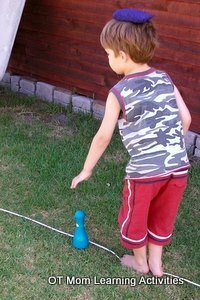 Make it harder by asking your child to stop, and bend over to touch the bottle midpath without letting the beanbag drop. Walking heel-to-toe is harder and requires more core stability. 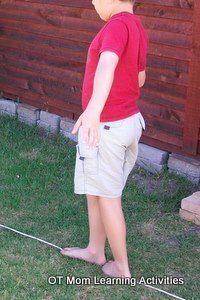 Try this once your child can walk normally along a length of rope without falling off. Very Important: Encourage your child to WALK SLOWLY! This will require more core muscle control from your child. If your kids keep losing their balance in this activity, then show them where their tummy muscles are and ask them to pull them tight while they walk. They can try pulling their belly button in towards their spine to activate their core muscles. Some kids just don't use their core muscles unless we remind them! Have your child keep knees and feet together while lifting the buttocks off the ground. This exercise strengthens the muscles around the hips and back, which are all part of the core. Ask your child to hold the bridge position for a few seconds. Increase the time, or the number of repetitions, as your child improves. Make it fun by driving toy vehicles under the "bridge" as this child is doing! Ask your child to get into this position. Put a beanbag or soft toy on the tummy – your child will have to keep it from falling off by not letting his/her back slump to the grass like this. 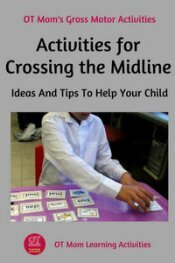 As this activity is quite demanding, set a short distance (2-3metres) for your child’s first attempt, and include it as a small part of an obstacle course or follow-my-leader game. As your child’s endurance increases, you can increase the distance set. You get lots of different kinds of leg lifts, but this is a handy one for the classroom (although these pics were taken outside!). 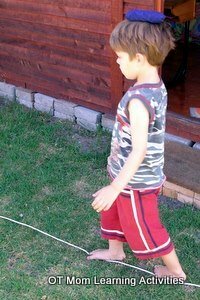 It helps for adults to demonstrate this exercise so the child gets a better idea of the pace - as always - SLOWER is best! Have your child stand sideways behind the chair so the left hand is resting lightly on the back of the chair. Slowly lift the left leg, keeping the knee bent until the hip is bent 90 degrees as shown. Hold it, and slowly lower the leg ALMOST to the ground, don’t touch the ground! Now raise it again. Repeat once or twice. Don't forget to turn around so the other hand can rest on the chair and do the exercises with the other leg. Just do a few repetitions with each leg at the beginning and increase repetitions as your child’s endurance increases. If your child keeps losing their balance, then show them where their tummy muscles are and ask them to pull them tight while they lift their leg. They can try pulling their belly button in towards their spine to activate their core muscles. 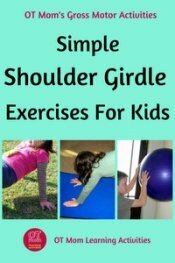 Climbing up trees and clambering over jungle gyms are "sneaky" core exercises for kids who dislike doing specific exercises like the ones suggested on this page. Climbing, pulling and clambering can help your child work on core strength and stability. Your child will benefit immensely from hours spent at the park! Any activity that requires your child to lift both feet together (eg to swing both legs over a bar, or lift them both to wrap around a branch) will use the core muscles. Encourage your child to pull up on knotted ropes or balance on low beams. If at first they don’t succeed, encourage them to keep trying at least once every time they go to the park – they will soon surprise themselves! 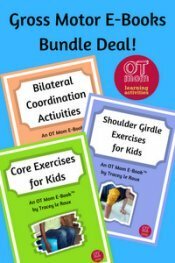 The free core exercises for kids on this page are just a taste of the many core strengthening exercises and activities suggested in this OT Mom e-book. 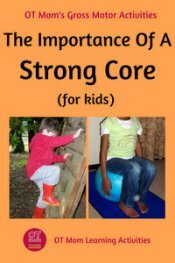 For the price of a couple of cheap coffees you can download an e-book containing more than 20 pages of photographed core exercises for kids. Read a full description and reviews over here! 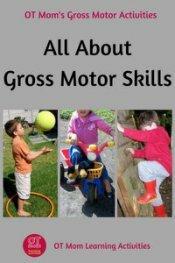 If you enjoyed these core exercises for kids, you may be interested in some of the other gross motor pages on my site - happy browsing! Thank you for visiting! Why not sign up for my free, occasional newsletter to stay in touch with new and updated pages on my site?